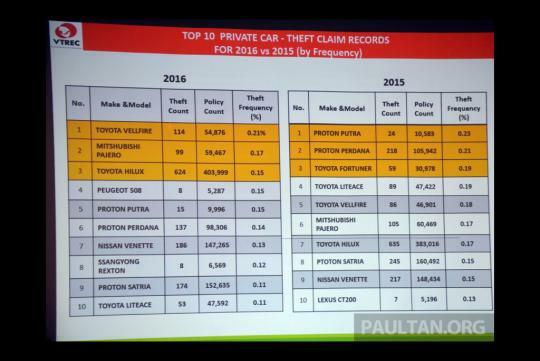 The General Insurance Association of Malaysia (PIAM) recently revealed thieves in Malaysia love Toyotas most, with the Toyota Hilux and Vellfire leading the chart in terms of theft frequency. Mitsubishi's Pajero splits the the pair to complete the top three position, according to Paultan.org. This comes after PIAM CEO Mark Lim pointed out that the police and customs have done a good job in crippling car theft gangs and syndicates, with reported vehicle theft down 20 percent as compared to last year. While the Vellfire is understandably high in demand, as 'towkays' in neighbouring countries love them, we were quite surprised to see the Peugeot 508 appear in the top 10 list. Elsewhere in the list, the demand for commercial vehicles like the Toyota Hilux, Mitsubishi Pajero and Nissan Vanette are a sign that these hardy vehicles are good work horses for the less developed countries. Why is it we are often bothered by our neighbouring countries? In addition, there is also a prolific amount of data. The information details often times put our own (Singapore) to shame. For those who go slamming Malaysia for poor policing. We need to takes things in proper perspective. Malaysia is many times bigger than Singapore. There lots of small towns in Malaysia. A generic car or truck can easily get lost in Malaysia. But because Singapore is do tiny and built up, if you loose your underwear in Jurong, someone in the East Coast can easily find it for you. While I was conversing with a big time robber from Europe, he tells me nobody actually steals but often it is more like "permanent borrowing". "We need to takes things in proper perspective." Actually wrong way to put it. It should be the highest demand for stolen cars is Toyota. It's not like thieves are stealing Toyota for their own use. They steal according to demand. Thieves love money.